Which are the targets that could be run with make ? In this tutorial you will learn how to install ViSP from source on CentOS. These steps have been tested with CentOS 7.0 (x86_64) and with CentOS 7.2 (x86_64) distro, but should work with any other distribution as well. First create a workspace that will contain all ViSP source, build, data set and optional 3rd parties. This workspace is here set to $HOME/visp-ws folder, but it could be set to any other location. To have a trial, just jump to Install ViSP dataset before running some binaries that you just build or jump to Next tutorial. You can later come back to the Advanced ViSP installation. ViSP is interfaced with several 3rd party libraries. The complete list is provided here. ViSP can be used without any third-party since all of them are optional. But obviously in this case, as we do not want to reinvent the wheel, some features implemented in third-party libraries will not be exploitable through ViSP. It is therefore possible to skip in a first time this section and start directly to Quick ViSP installation. Later, if you realize that a third-party library is missing, you can still install it, go back to the build folder, configure ViSP with CMake to detect the newly installed third-party library and build ViSP again as explained in How to take into account a newly installed 3rd party. We give also the way to install other 3rd party libraries to enable specific capabilities. We suppose now that ViSP source is in the directory $VISP_WS/visp. The following should be adapted if you downloaded ViSP from a zip or tarball. In that case, the source is rather in something like $VISP_WS/visp-x.y.z. 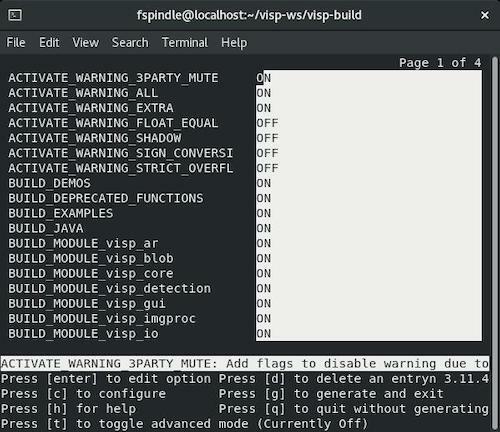 In the workspace, create first a directory named visp-build that will contain all the build material; generated Makefiles, object files, output libraries and binaries. The following image shows that this command allows to configure (just by pressing [c] key) the build in a more advanced way where some options could be easily turned ON/OFF. It allows also to see which are the 3rd parties that will be used. To generate the makefiles, just press [g] key in the ccmake gui. Snapshot of the `ccmake ../visp command used to configure ViSP. We suppose now that the data are located in $VISP_WS/visp-images-3.2.0. Here you can check the content of the ViSP-third-party.txt file and see if the newly installed 3rd party is well detected (see Which are the 3rd party libraries that are used in ViSP ?). Some of these libraries may not be found correctly. The problem was that libpthread.so exists in /usr/lib64 and in //lib64. In //lib64 it should be a symbolic link to /usr/lib64. A work arround consists in installing a more recent OpenCV version from source.